The Gender Programme was established to ensure that NACA implements the action plans on gender mainstreaming within its activities. With a continued interest in embracing gender integration among relevant agencies, NACA aims to build up capacity of members in gender mainstreaming in all its undertakings, and motivate support and action globally. Insufficient capacity for gender research and application among stakeholders is a hindrance to effectively implement programs integrating the gender dimensions in development. Adding a gender dimension in aquaculture value chains will give assurance to consumers that seafood has been produced sustainably. Women, Youth and Aquaculture Development Programme. Organising and supporting symposia on Gender in Aquaculture and Fisheries. Capacity building on gender integration and mainstreaming. Curriculum development on gender in aquaculture and fisheries education. In-country gender assessment reports for policy, action and research. 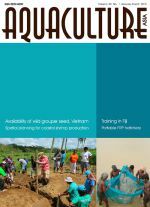 Publication of case studies and success stories on gender in aquaculture value chains. Coordinating the Regional Gender Practitioners’ Network and mentoring programmes. Campaigns and policy advocacy for gender integration in aquaculture. A collection of subject tags relating to technical matters. The AFSPAN Project was a three-year initiative to improve our understanding of the role of aquaculture in food security, poverty alleviation and human nutrition. The project developed new methodologies to quantify the impact of aquaculture in developing nations and low income food deficit countries. The findings will contribute to more efficient planning, coordination and implementation of research and development programmes increasing aquaculture impact on food security, livelihoods and poverty alleviation for the poor. 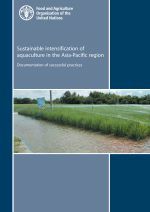 This publication is the major output of a regional programme jointly implemented by FAO and NACA in 2015 to document and disseminate successful practices that contribute to the sustainable intensification of aquaculture in the Asia-Pacific region. Twelve practices are described that contribute to at least one of the following: Improved production and resource use efficiency (land, water, feed, energy); improved environmental benefits; strengthened economic viability and farmers' resilience; and improved social acceptance and equity. Aquaculture feed supply chain attracting scrutiny. Pond beauty contest, Ram Kumar and social development. Culture modes of giant freshwater prawn in Yangtze River Delta for early harvest. Fish marketing in Kashmir, India - a case study of Srinagar. Community-based integrated fish-duck farming: A boon for rural development in agro-climatic conditions of Assam, India. Gastropod and bivalve fishery of Kakinada Bay, Andhra Pradesh, India: Management and conservation issues. 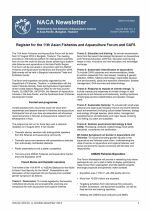 Register for the 11th Asian Fisheries and Aquaculture Forum and GAF6. 6th Global Symposium on Gender in Aquaculture and Fisheries. Global Conference on Climate Change Adaptation for Fisheries and Aquaculture. A Review of women's access to fish in small-scale fisheries. Aquaculture operations in floating HDPE cages: a field handbook. 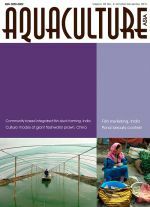 Aquaculture seed and feed production and management in Bangladesh: Status, issues and constraints. 12th Technical Advisory Committee held in Cha-am, Thailand. Audio recordings: WAS special session on regional cooperation for improved biosecurity. AFSPAN Final Technical Report now available! Pillay Aquaculture Foundation Awards for Scientists in Least Developed Countries. Gender seminar conducted and ASEAN Gender Network launched. A two-tube, nested PCR detection method for AHPND bacteria. 9th Regional Grouper Hatchery Production Training Course. Developing an environmental monitoring system to strengthen fisheries and aquaculture in the Lower Mekong Basin. Asia-Pacific Regional Workshop on the Status of Aquatic Genetic Resources for Food and Agriculture. 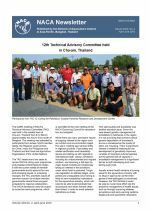 The twelfth meeting of NACA’s Technical Advisory Committee (TAC) was held in the coastal town of Cha-am, Thailand from 9-12 March. The TAC meets every two years to review NACA’s rolling work programme and propose amendments to realign it with the current needs of member governments and to account for new and emerging issues. In proposing changes, the TAC prioritises issues of common concern to member governments where there are prospects for regional collaboration. The Gender and Aquaculture Seminar: Equity and Regional Empowerment in the Aquaculture Value Chain, a culminating activity for the NACA/USAID/MARKET Project’s Thematic Studies of Gender in Aquaculture, was held from 24 to 25 February 2015 in Bangkok. The project conducted research on womens’ roles and influence on selected aquaculture value chains in Cambodia, Lao PDR, Thailand and Vietnam. The goal of the research was to raise awareness and increase recognition of gender roles. The USAID Maximizing Agricultural Revenue through Knowledge, Enterprise Development, and Trade (MARKET) Project and NACA are hosting a Gender and Aquaculture Seminar: Equity and Regional Empowerment in the Aquaculture Value Chain on February 24-25 in Bangkok, Thailand. The USAID MARKET Project and NACA have undertaken a year-long research project on women’s roles and influence on selected aquaculture value chains in four countries in Southeast Asia. Further training provided to aquaculturists in Fiji. Spatial planning for sustainable coastal shrimp production. Availability of grouper (Serranidae) fingerlings and seed in the coral reef of Son Tra Peninsula, central Viet Nam. Small-scale carp seed production through portable FRP hatchery at Khanguri, Odisha. 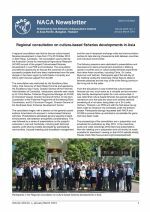 Regional consultation on culture-based fisheries developments in Asia. Gender Assessment Synthesis Workshop. Broodstock management in aquaculture. Urgent appeal to control spread of the shrimp microsporidian parasite Enterocytozoon hepatopenaei (EHP). Regional consultation on culture-based fisheries developments in Asia. Gender Assessment Synthesis Workshop. NACA participation in the 5th Global Symposium on Gender in Aquaculture and Fisheries, Lucknow, India. Broodstock Management in Aquaculture: Long term effort required for regional capacity building. Urgent appeal to control spread of the shrimp microsporidian parasite Enterocytozoon hepatopenaei (EHP).